Local Authorities have written to the Department for Transport asking for the maximum fine for illegal parking to be raised from £70 to £120 (still subject to an early payment 50% discount) giving a maximum cost of £60 for someone who pays quickly. This request is for maximum fines outside London to be able to be as high as in London. While researching this just now I came across a long rant about the injustice of it all in the Independent in 2006 titled Highway Robbery. The AA say that it was a ‘clear breach’ of the government’s rules because “The guidelines state that local authorities should not view civil parking enforcement as a way of raising revenue”. Firstly, surely the purpose of a penalty for breaking the law should be sufficient to encourage compliance? If parking legally costs £20+ (as it does in Cambridge and some other places) then the fine needs to be considerably higher than that should it not? Secondly. What is the cost of illegal parking? The total national fines were £330m last year. What does the AA think that should cover? Just the salaries of the parking wardens and police? 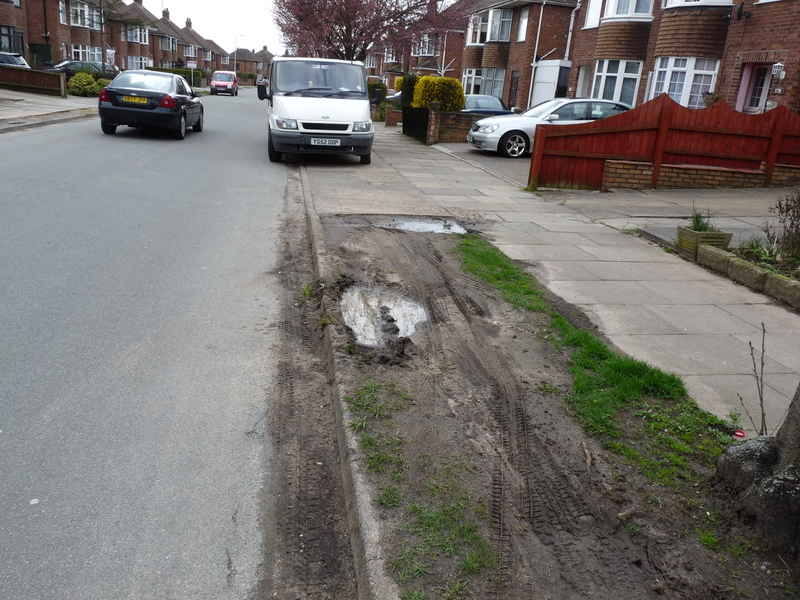 What about the legislation regarding the creation of yellow lines (£1,500 a time), installation of all the bollard sand fences needed to physically stop drivers parking on the pavement, the costs of repair cracked pavements and verges turned to mud as in the following picture. Personally, I think that the AA keeping are keeping their blinkers well and truly fixed on the narrow enforcement costs. Is it not the motorists who are doing the ‘highway robbery’ by claiming all of the highway and then taking a chunk of the pavement as well. In addition they then use every trick in the book to make enforcement difficult? People may be interested in seeing the fuss and denial over the years about speed cameras which raise £110m per year all of which was used for road safety work until this year when the new government ‘raided’ 40% of it. Check out the Wikipedia articles on UK speed limits and UK speed limit enforcement but if you really want to see it ‘warts and all’ then look at the associated talk pages and history. The encouraging thing is that the RAC Foundation and the AA are now supporting speed cameras. I will take a look into what the costs are and do a post about it soon. It was, of course, only because the parking enforcement was so broken in the first place that I started this blog.